NESTLED BETWEEN THE MAJESTIC BLUFFS AND THE MIGHTY MISSISSIPPI RIVER, THE SAFE LANDING MOTEL IS THE PLACE TO STAY FOR ALL YOUR COULEE REGION ADVENTURES. The Safe Landing Motel is a family owned and operated motel located in Stoddard, Wisconsin, on beautiful national Scenic Highway 35 “The Great River Road.” We are open year-round offering 11 clean, comfortable and affordable rooms. 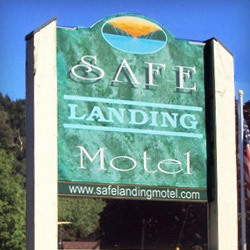 Safe Landing Motel is located just 7 miles south of La Crosse, WI, in the town of Stoddard, where you can find several convenient eating options within walking distance. Excellent dining includes The Thirsty Turtle Bar and Grill and Rocky’s Supper Club, both only 5 blocks away from the motel. Kwik Trip convenience store and Hood Scoops Ice Cream Shop are only 1 block away. Pizza delivery is available, as well as picnic tables, chairs and grills for your own use. We always look forward to seeing old friends and welcoming new guests! Freezers For Fish And Game.